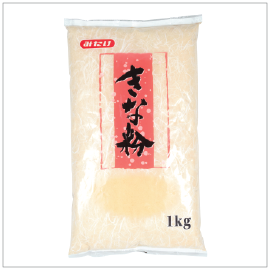 Kinako, more commonly known as soybean flour, is widely used in traditional Japanese sweets. In order to create the golden-brown soybean flour, soybeans are first toasted then finely milled into powder. Its toasty, nutty fragrance and flavor slightly reminisces roasted peanuts but has its own uniqueness. Kinako is slowly growing popularity for being a superfood—high in protein, fiber, calcium, iron and other minerals—great alternative of pre-formulated protein powder to make shakes, substitute to make baked goods, or simply dust over ice cream, mochi, or other Japanese-style sweets.